The 288,000 new positions in April make welcome reading. But since 2010, GDP has increased only slowly relative to employment. That means productivity growth has been weak, especially compared to the last recovery starting in 2002. That’s a problem if it persists. 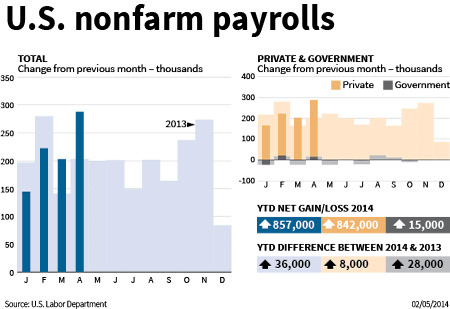 The U.S. economy added 288,000 nonfarm jobs in April, according to the Bureau of Labor Statistics on May 2. The unemployment rate fell by 0.4 percentage point to 6.3 percent. In the four years starting with the first quarter of 2010, nonfarm employment expanded by 6.3 percent in aggregate while real GDP grew by 9.2 percent, suggesting an increase in output per worker of about 0.7 percent per year on average – one measure of productivity growth. In the four-year recovery period starting in the first quarter of 2002, productivity growth calculated in the same way was 2.2 percent a year, while from 1992 it was 0.9 percent and in the equivalent period starting in 1983 it was 1.7 percent.